As we age, we experience reduced sensation and a decrease in circulation in the lower extremities of our bodies. We are also very likely to be affected by foot-related conditions such as ingrown or fungal toenails, arthritis, corns, calluses, and diabetic ulcers. For these reasons, foot care is an important part of achieving and maintaining good health as a Senior. Proper geriatric foot care contributes to a person’s ability to stay healthy. It is an important factor in determining a person’s ability to remain independent and active. Proper geriatric foot care can be achieved by following these guidelines. Healthy feet rely on prevention and maintenance. If unnoticed or untreated, redness, sores, swelling, cuts, blisters, ingrown or infected toenails, or bruises can lead to serious infections and foot ulcers. They can also be the first signs of more serious medical concerns like diabetes, poor circulation, arthritis, and nerve damage. If you are unable to do visual inspections of your own feet, ask for assistance from a friend or family member. Feet should be thoroughly washed and dried every day. Unscented lotion or cream should be used on the top and bottom of your feet if the skin is dry or cracked. Powder can be used to keep your feet dry if they tend to be sweaty. Clean and dry shoes should be worn and rotated regularly. Clean white socks will not only keep your feet dry but will also show drainage from openings that might not be felt or easily seen during a self-inspection. Toenails should be cut straight across, never shorter than the end of your toes. Sharp edges should be filed. Improperly trimmed nails can cause ingrown toenails and infection. 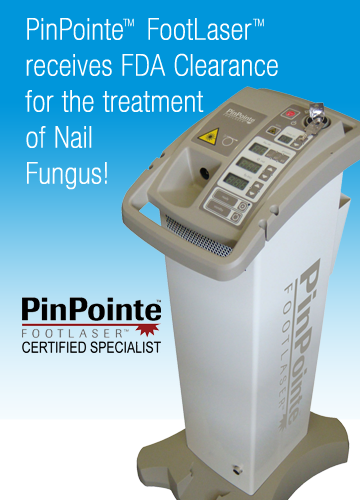 Should a toenail become ingrown, infected, discolored, or extremely thick, contact Dr. Burmeister to arrange for proper care. Shoes should provide protection, comfort, and support. Choose shoes with roomy toe boxes, arch supports, low heels, rubber soles, and room for your socks of choice. Socks with ridges or elastic at the top should be avoided. A pumice stone should be used on calluses when your feet are wet. Do not use over-the-counter corn pads or medications. Wear socks at night to keep your feet warm. Consult with Dr. Burmeister to determine if custom orthotics may be of benefit to you. Elevate your feet when you are sitting or lying down. If you have to sit for a long period of time, stretch and move your toes and ankles. Take walks. Treat yourself to an occasional gentle foot massage. Avoid wearing anything tight on your legs other than prescribed compression stockings. Avoid sitting with your legs crossed at the knees. Exercise daily, eat for good health, and maintain a healthy weight. Do not smoke. feelings of numbness, cold, “pins and needles”, cramping, or pain in your feet. Seniors who have difficulty following these guidelines should be cared for by a healthcare professional. Dr. Burmeister and the staff at Jacksonville Foot and Laser will provide proper geriatric care necessary for Seniors to lead full and enriched lives as they age. Seniors or their caretakers can schedule an appointment by calling (904) 765-8889 or by completing an online appointment request HERE.